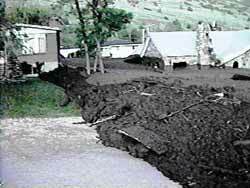 Debris flows are often called mudslides, mudflows, or debris avalanches. They consist of debris mixed with water. Debris is mainly soil and anything else, such as trees and rock fragments, that are picked up as the flow moves down a slope or channel. Debris flows may be generated when hillside colluvium or landslide material becomes rapidly saturated with water and flows into a channel. Intense rainfall, rapid snowmelt, or high levels of ground water flowing through fractured bedrock triggers the movement. 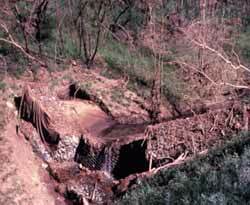 Debris flows and floods also occur when heavy rains on slopes cause extensive hillside erosion and channel scour. Repeated debris flows and/or floods deposit sediment at the mouth of a canyon, forming an alluvial fan. The fan shape is a result of periodic diversion of the main channel back and forth across the fan. Flows may travel farther down the fan from the mouth of the canyon if the channel becomes entrenched and the flow is confined. Alluvial fans are risky places for homes because it is difficult to predict where flooding or debris flows will occur. Debris flows can be as thick as wet concrete and can transport boulders as large as a car; debris flows may eventually become muddy flood waters as they deposit their debris. 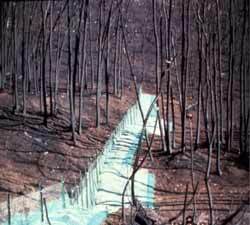 Debris flows tend to move in pulses. Early pulses or previous debris flows form levees that channel the flow until the levees are breached. 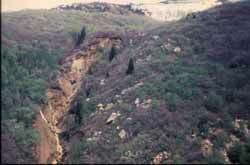 The presence of older levees indicates the recurrence and characteristics of debris flows in a particular canyon. 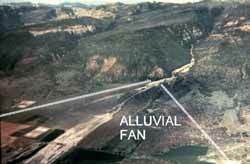 This is valuable information for developing land on the alluvial fan. distributing or diverting debris on the alluvial fan away from structures. 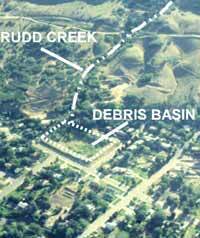 Most of the debris in a debris flow is picked up as the flow moves down a stream channel; the debris collects in the channel from slope erosion or from other debris flows that did not make it to the mouth of the canyon. Slope erosion can be reduced by terracing, reseeding after wild fires, and intelligent land use such as controlled grazing. Debris can be trapped using sediment fences on slopes, gabion baskets or check dams in channels, and debris basins on alluvial fans. With proper design and construction, debris and water can be diverted away from buildings by a “plow-shaped” deflection wall, or debris can be trapped with a chain-link fence strengthened to hold the debris.